Because of human-induced habitat loss and homogenization, it is important to understand the relationship between habitat complexity, biodiversity, and predator-prey interactions. In intertidal oyster reef communities, consumption rates of individual predators in isolation from each other are lower in a more structurally complex habitat (oyster reef) than a less complex habitat (sand flat), yet consumption from combined predation surprisingly does not differ between the two habitats due to variation in predator interactions (Hughes and Grabowski 2006, Oecologia). Similarly, a trophic cascade involving multiple top predators, an intermediate predator, and their basal oyster prey was weaker in more complex habitats due to a reduction in predator interference interactions (Grabowski et al. 2008, Ecology). 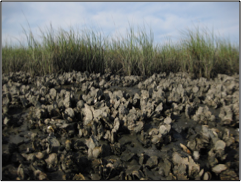 These previous oyster studies provided much of the background for an NSF-funded collaborative research project examining consumptive and non-consumptive predator effects on oyster reef ecosystem function across a biogeographic gradient (Kimbro et al. 2014 Ecology Letters, Byers et al. 2015 Limnology and Oceanography). Recent experiments examined the effects of predator (catfish) cues and consumer density on oyster survivorship (Hughes et al. 2012 Plos One). Genetic variation within and among oyster populations can influence oyster growth, survival, and disease prevalence. We tested the strength of local adaptation in 6 oyster populations in the South Atlantic Bight. We also examined the effects of oyster intraspecific diversity on oyster demographic traits across different environments to assess the magnitude and direction of genetic diversity effects on vital rates in the presence and absence of predation (Hanley et al., In Review).